In the lane, outdoor in the sunshine, artists set up their easels to allow people to see their artwork while visiting Old Quebec in Quebec City, Canada. 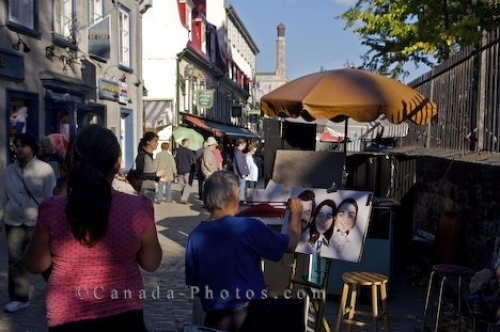 As the warmer climate arrives in Old Quebec in Quebec City, Canada, artists set up their stands and easels outdoors to create new masterpieces. Tourists stroll through these historic lanes where they can browse through the shops, enjoy a fabulous meal, relax in a cafe or stop to look at all the artwork for sale at each artists stall, all which is surrounded by years of history. There is so much to see along each lane in Old Quebec that it can take a few days of your vacation to see everything this quaint area has to offer. Old Quebec was put on the UNESCO World Heritage List in 1985 as it was acknowledged for its cultural and historical importance. Photo of people admiring the work done by artists in an outdoor atmosphere along a lane in Old Quebec in Quebec City, Canada.